Three Phyllis Court players were in tournament action this weekend around the country. The Welsh CA discovered that Chris Roberts' previous 10 residency in the Principality qualified him to play in the Welsh AC Championship - so he did and after an extremely quick main event exit at the hands of top seed Ian Burridge, Roberts won the plate event (even though nobody knew the whereabouts of the trophy!). Raouf Allim helped High Wycombe to third place at their debut at the Southern Challenge GC team event at Southwick (near Brighton) and he is now closing in on a -1 handicap apparently. 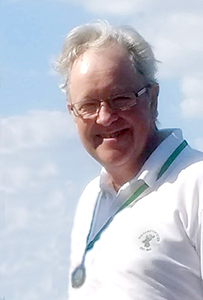 Closer to home, David Hopkins found and AC tournament at Blewbury on Sunday and we await details of how he faired. Phyllis Court 'C' suffered their first defeat of the season at Harwell today. Trailing 1-3 after the two doubles rounds (Delia Norris and debutant Bill Pitkeathley scoring the win for Phyllis Court), the 'C' had it all to do in the eight remaining singles games. They slipped further behind in the first singles round when only captain Raghu Iyer was able to record a win. And although wins from Norris and John Maguire halved the last singles, it was a disappointing 4-8 result for the hitherto unbeaten 'C'. PCC 'C' - Raghu Iyer (5), Delia Norris (5), John Maguire (9), Bill Pitkeathley (9). Five runner-up places in a row at the Ryde GC Open is getting a bit ridiculous for Chris Roberts, who extended his run of 'always being the bridesmaid' this weekend. In the scorching heat he dropped three block games but still came second in his side of the draw on Saturday, and then won through 'best of three' matches in the quarter and semi-finals. But as so often before, he was beaten by a local man on his own turf and in this case our good friend Roy Tillcock too the spoils whilst Roberts added to his collection of 'silver' medals! Phyllis Court's other representative David Hopkins was defending the 'plate' he won last year, but didn't get the run of the balls this time. 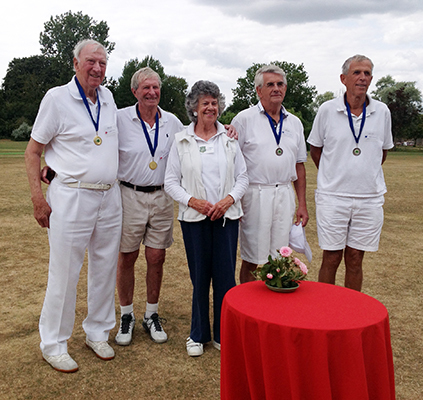 A spirited come-back took Phyllis Court Croquet into the National Inter-Club Semi-Finals on Monday. The Henley side were looking at a tough afternoon ahead, needing to win three of the four remaining singles rubbers in order to turn around the trailing lunchtime 1-2 score-line of their quarter-final tie against Sussex County, at Southwick (near Brighton). Chris Roberts and Roger Goldring had lost their morning doubles rubber to the accurate centre-ball clearances of the hosts Liz Farrow and Richard Brooks 5-7, 3-7, and Phyllis Court's Helena Fensome had come second best to Chris Heath 4-7, 6-7. However, confidence was gained by Raouf Allim's solid 7-4, 7-4 win over the Sussex captain Roger Sutton, and whilst he looked good for an afternoon success, the other rubbers had the feel of being too hard to call. Once the second half of the fixture got under way, Fensome showed good fortitude after the morning's disappointment and rattled off a very quick dispatching of Sutton 4-7, 6-7 to level the match score. Allim duly say off Heath 7-5, 7-5 which left the match hanging on the two senior singles rubbers with Roberts one game up in his but Goldring trailing. Goldring pulled his rubber level as Roberts game approached its zenith with Farrow trading clearances and accurate ball placing with the Phyllis Court man. It was inevitably going to come down to the odd error or loose shot in an increasingly high-quality ending which matched the high stakes. Roberts was cleared three ties from the jaws of hoop 11 which would have sealed the game, rubber and match, but it was only when Farrow finally missed a crucial clearance at hoop 12 that Roberts ended the contest with much relief. With the match result beyond doubt, Goldring's outstanding rubber was left as a tie giving a final score of 4.5 to 2.5 to Phyllis Court. This now sets up a mouth-watering national semi-final tie for Phyllis Court at home to the very strong Dulwich club who will be led by Belgian captain Pierre Beaudry with team that are likely to all be ranked in the UK top 40. Raouf Allim's four game wins today saw his handicap reduce to -1 for the first time which is due reflection of his increasing ability and familiarity with the GC game - Congratulation's Raouf! Captain Raymond Wood reports that PCC 'B' were held to a 6-6 draw by Basingstoke today, playing on courts at the Winchester club. Star of the day was Hugh Crook who won both his singles games. 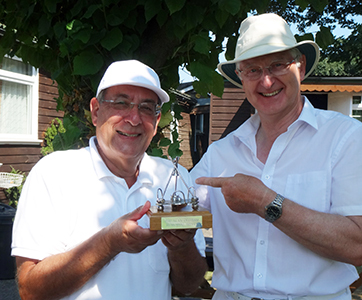 A great day's croquet collimated victory in our top ranked Open Singles tournament for Raouf Allim today. He lost only once in his seven games and was a clear two wins ahead of the pack at the end. Robin Coates had a wonderful day as the pre-tournament 'outsider' and end ended wit three wins when his seeding predicted none. He reduced his handicap to 4 for the first time and congratulations to him. Elsewhere, the rest of the filed robbed gams off each other whilst Allim looked to be the in form player from the off. 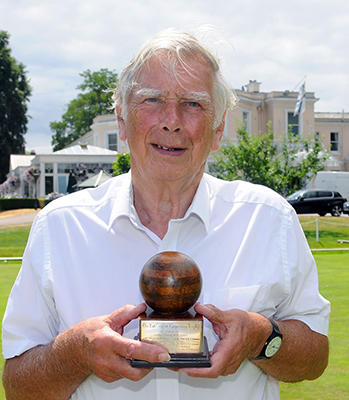 He was beaten just the once by Chris Roberts, who finished third on net hoop count behind runner-up Roger Goldring, but it was Allim's day and he was a clear and very worthy winner of the Blue Ball Trophy for the first time. Mike Christmas won all four of his games in this morning's AC One Ball Handicap tournament and in doing so he reached an unassailable position. Instruction beforehand proved useful to the novices and beginners alike and it was good to see that all mastered the unfamiliar two-ball croquet stroke quickly. Bill Pitkeathley and Tony Peperell (who both appear to have really got the croquet bug) showed well in the first couple of rounds, as did Edmund Shirley and Diane Browne who were on more familiar territory. But it was Christmas who was the only player to win two out of two, and then he won twice more and could not be caught, even if there had been time for further games with AC old hands Frances Colman and Chris Roberts. With time pressing and the and the arrival of the GC Mix-in players, there was time enough for the presentation of the lovely Wooden Ball trophy to worthy winner Mike. Our 'Friendly' GC team scored a very narrow victory of visitors from the Hurlingham Club today. A first round of level play doubles was halved and that set the pattern for the next three rounds of handicap and level play singles, each one of which could not separate the sides. The hosts' Colin Morgan revelled in being given the captain role to the extent that he was the only player undefeated all day and with good wins for Christine Searle, John Maguire and Tony Peperell along the way, it wasn't until the fifth and last round that Phyllis Court got their noses infront to record a 9 - 8 victory. Featuring international players Charlie von Schmeider (PC) and Pierre Beaudry (Dulwich), and six other players in the UK top 60. The best croquet quality you will see this year right on our own courts - come along to support Your Club team in our second only appearance in the national semi-finals. Play will start at 1000, break for lunch at 1300 to 1345, and conclude at about 1700. A big crowd is expected, so to be sure of a seat, bring your own deck chair! Two Phyllis Court partnerships cleaned up at the Thames Valley CC Mens Doubles today (photo left). Congratulations to Raymond Wood and Mike Fensome who won the event, beating Hugh Crook and Robin Coates in to seccond place. More deatils when known . . . The wheels came right off PCC 'C's season today, with this second defeat in a row killing off hopes of the Handicap League title this year. It all went wrong in the doubles where hosts Blewbury won three of the four games that stated this fixture. Round three was a clean sweep for Blewbury and then with players matched with different opponents, fortunes were reversed and the last round was won outright by Phyllis Court 'C'. This made for a more respectable 7-5 score-line that otherwise might have been the case, but doubtless disappointment regardless. 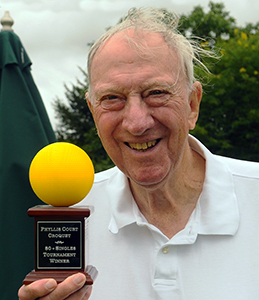 It is with sadness that we tell you that long standing croquet member Robert Mulligan has died. Our condolences go to his widow and fellow croquet member Jane and this difficult time. Robert was primarily an AC player and for some years was a stalwart of the weekly AC mix-in sessions. He has his name on the Zia Stirling Cup (for the High Handicap Singles at the Summer tournament) as its 1999 and 2007 winner, sadly before my time in AC. 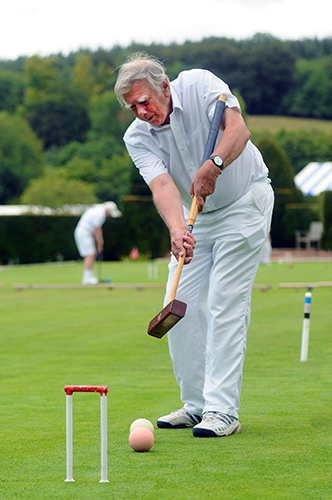 In recent years Robert and Jane spent some considerable time in New Zealand but, with failing eyesight, his croquet playing career ended a while ago now. There will be no Handicap League title for Phyllis Court teams this season after PCC 'B' lost to Wingave today dashing even the slimmest of mathematical chances of glory. They were down 1 - 3 after the two doubles rounds and that was enough as the two singles rounds were both halved. Only Mike Fensome managed double singles victories. Charlie von Schmieder (left) was on good form this weekend playing for Ireland in the GC Home Internationals at Surbiton. He started well winning his (best of three) singles rubber 2 - 0 against Wales and repeated the feat against Scotland with doubles wins in the two matches which Ireland both won. England turned the same trick to set up a last round decider with Ireland. von Schmieder got the middle game off England's 'most improved player' Jonathan Powe in intimate defeat and our man shred his singes rubber as well, but it wasn't enough to stop England retaining he title inaugurated last season. Ireland came second behind England with Wales third and Scotland collecting wooden spoon. von Schmeider will be in action for Phyllis Court in next Sunday's BIG MATCH v Dulwich. Phyllis Court 'A' went back to the top of the SCF Level League with an impressive 7 - 0 victory over Blewbury today. Chris Roberts and Roger Goldring won the morning doubles in straight forward fashion, as did Raouf Allim in his singles. Helena Fensome dropped the middle game of her singles but recovered in the decider to give PCC 'A' a comfortable 3 - 0 lead at lunch. Some of the afternoon singles matches had close scores but all were won in straight games. The AC Summer Handicap Tournament (Senior class) took place today in the blistering sun. The final game of the 'all play all' format turned out to be the decider between the tow undefeated players Robin Coates and Chris Roberts, and this was put on ice untill another tome as the heat of the day took it's toll. 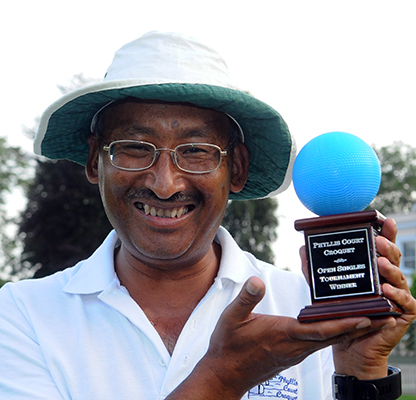 PCC 'B' lost in the handicap leage today - details to follow . . .
Mike Christmas (left) won a close two game match on 'hoop points' from Edmund Shirley to decided the AC Summer Tournament (Junior class) title today. Shirley won their first game +2 but more went right for Christmas in the second game and he pegged-out just before time for a winning margin of +11, so won the match by +9. He is pictured here with the lovely Zia Stirling Cup. It came as complete surprise to Madeleine Probert that she had won the second running of our 8+ Singles tournament today. But when she finished her six game programme with only one loss, only Michael Christmas had the same record and Probert had beaten Christmas in their 'head to head' game earlier in the day - so she won the event on the 'who beat whom' rule. This was a very well supported tournament with 14 players that included (very pleasingly, several who were beginners this April. One of those Bill Pitkeathly, was the only one to take a game off Probert and he ended on 4 wins from 6, one behind the top pair. Christine Searle got the same score and finished third overall thanks again to her 'head to head' win over Pitkeathly. But it is commiserations to Christmas and congratulations to Probert who celebrates this her first singles tournament win. We have a new National Champion in our midst! 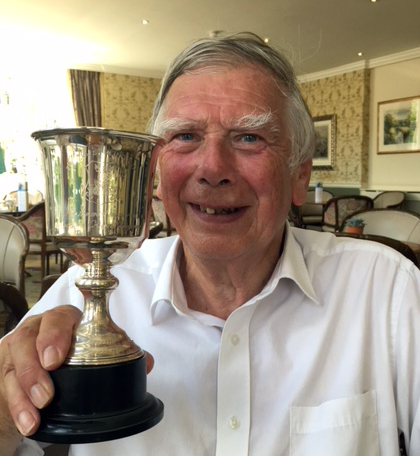 Roger Goldring won the National Veterans' Championship title today at the end of a gruelling three day tournament under the scorching Sussex Sun. He managed to get through the block stage but not without a couple of unexpected losses, to qualify for the last eight knock-out and came up against the much improved Liz Farrow from the host club Sussex County CC at Southwick near Brighton. The semi-final should have been a real test on paper against the higher ranked Nelson Morrow of Hulingham, but Goldring produced some of his best play this season to beat Morrow with unexpected ease in the first game and then with rather more of a challenge in the second (7-2, 7-6). And so to the final which was (rather pleasingly) against a good friend of Phyllis Court, neighbour Ian Shore of High Wycombe - (Ian comes to PC fairly often as a reciprocal member of the RAF Club). Roger and Ian spar very often in training together both at PC and Wycombe and know each others games well, but this time it was all Roger and he took the final match 7-3, 7-5. * Roger is the second current Phyllis Court member to win this title - Terje Johansen won it in 2011. 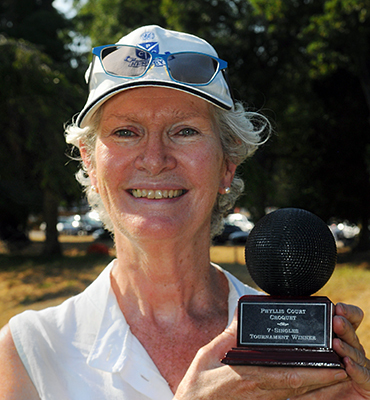 Carole Jackson has also won it, in 2013, but that was a couple of years before she joined Phyllis Court. The Service will be followed by a private burial. Afterwards refreshments will be served at Phyllis Court. Family flowers only please, but donations will be gratefully received for the charities Centre Point and Operation Smile. 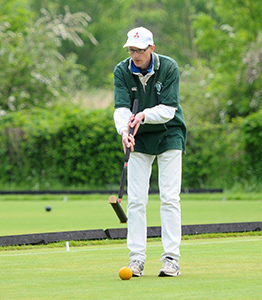 Three Phyllis Court players also had a rain affected weekend when the Sunday rains put paid to day two of the Wiltshire Open at Hamptworth, near Salisbury. Helena Fensome (who plays her tournament croquet using her former name Jansson) won 5 out of 8 on Saturday to qualify for the last eight knock-out the following day, so it was especially unfortunate that the tournament was abandoned. Mike Fensome scores three wins and Peter Haydon two. It was such a shame today that our much-anticipated big National Inter-Club Championship semi-final had to be postponed because of the waterlogged courts. We had everything ready – hoops in new holes, programmes printed, scoreboard arranged and even the centre-pegs had been re-coloured - but it wasn't to be. A new re-arranged date is being sought with Dulwich.